The Bluecolt Microlite and MicroliteUV Kit contain two high performance flashlights. The Microlite L.E.D. 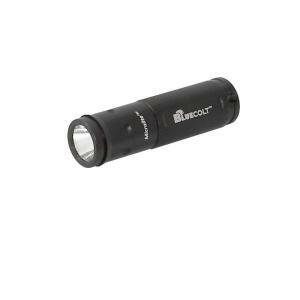 flashlight provides unmatched beam power in a super compact body and the MicroliteUV is a super compact UV black light. This unique blacklight L.E.D. has proven to be useful in forensic crime scene investigation and for practical applications, such as exposing watermarks in currency and other identification. Anodized aluminum body and polycarbonate lens make these a rugged pair of flashlights. Kit contains rechargeable batteries, recharging accessories, head-strap, neck-lanyard and red night-vision lens.Bluecolt flashlights have been tested in fire department burn simulations and have held up amazingly well. We carefully inspect each component for quality assurance in our stringent assembly process and test each finished flashlight prior to packaging. We even air-blow dust particles from our lenses prior to packaging. Our world-class manufacturing facility ensures a high quality product with unsurpassed reliability. Tbook.com crawls the web to find the best prices and availability on Flashlights and related Tools and Hardware products like BLUECOLT Microlite and Microlite UV Kit- Two Super Compact 60 Lumen Flashlights. For this page, related items include products we find that match the following keywords: "Flashlight" at our vendor partner Home Depot. BLUECOLT Microlite and Microlite UV Kit- Two Super Compact 60 Lumen Flashlights is one of 152 Flashlights and related products listed in the Tools and Hardware section of Tbook.com If you have any questions on this product, please give us a call at 734-971-1210 during the hours of 9am - 5pm EST for assistance. Thank you for shopping at Tbook.com, the Internet Department Store!